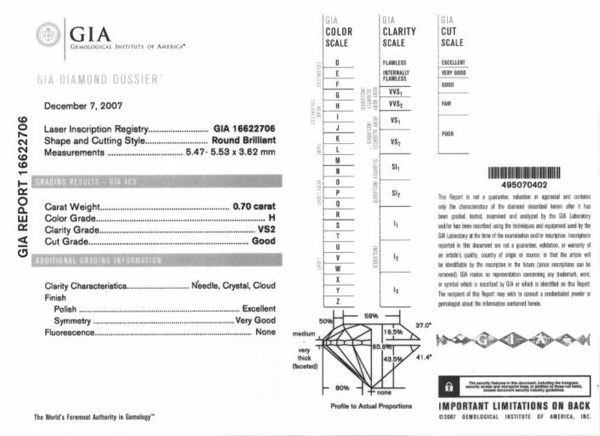 Originally, every diamond cutter or jeweller himself evaluated his diamonds to determine their value. The invention of specialized laboratories in the seventies which use advanced tools allows for a more scientific evaluation of diamonds. This is how internationally-reknowned labs like G.I.A. (The Gemological Institute of America) and H.R.D. (Hoge Raad voor Diamant) emerged. The role of these laboratories is to analyse diamonds and establish a certificate for each one of them to indicate their characteristics: the 4 Cs: diamond weight, diamond colour, diamond purity, diamond size, as well as their dimensions, fluorescence, polish and symmetry.